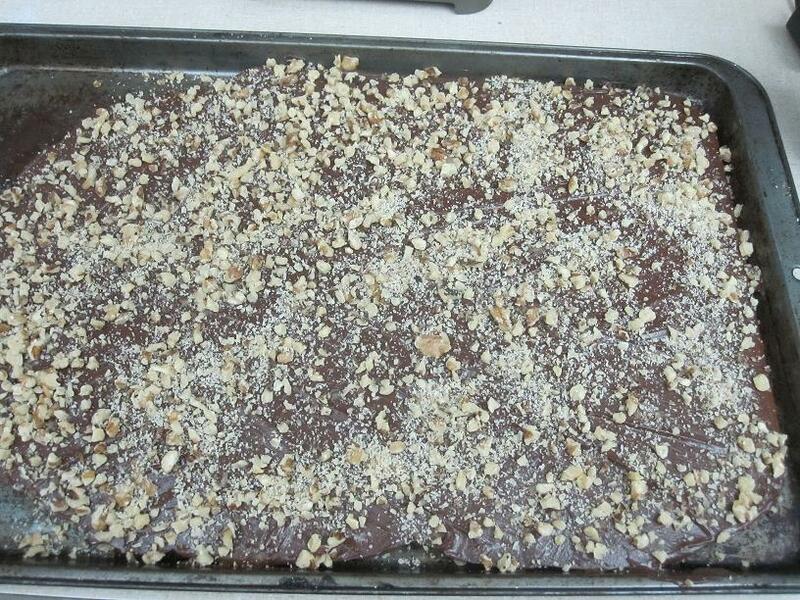 If you read my Sunday post, you know I made candy yesterday – Almond Roca to be exact. I have an old family recipe that my mother gave to me. I honestly don’t know how far back it goes – only that her mother passed the secret to her and she SUPPOSEDLY passed the secret to me. I had to go out and buy some normal measuring spoons and figure out how the hell big those ducks were so I could relax and enjoy our Thanksgiving kitchen. You see, when Turkey Day rolls around, it is the signal to my clan that it’s time to start baking. Other women shop on Black Friday. The women in my family bake their asses off. Every year of my childhood I hung out in the kitchen while my mother (and various helpers) made fudge, divinity, almond roca, Holly Candy, Russian Teacakes, several kinds of cookies and her famous mashed potato candy. My pan right after I poured out a batch of roca. That was more than fifteen years ago and, unfortunately, my mother has long since passed. But Homemade Roca is the gift that keeps on giving and I am famed far and wide for my Christmas baking. Note: I know people who will hate you like poison forever for bringing “their” dish to a gathering. It’s kinda spooky. I get asked for my roca recipe all the time (not that it helps people when I give it to them). In fact, in the spirit of generosity, I’ll put my mother’s recipe below. The sad reality is, if you don’t know the decoding secrets, you will have an epic fail on your hands trying it out. You see, those old family recipes LIE, even if only by omission. Finished roca - before breaking into pieces (I use a knife or a sterilized icepick and hammer). Apparently when it rains, candy-making changes (unless you have a candy thermometer). Now do YOU see a candy thermometer in that recipe? Thasss right, you don’t! I had to figure this all out myself one particularly rainy season. If you are armed with these secrets, you can make this candy when it rains and you don’t have to go on nuclear lockdown to ensure that you’ll hear “the pop” as you make your roca. I kid you not, we’d make people turn off the TV and any radios while we made roca just to be sure we heard those almonds. If someone really couldn’t shut their piehole, they were sent outside with the dogs. You still need to have a cast iron pan, and you’d better use Parkay so you don’t cry, but if you print out this blog, you should have everything you need to make my Almond Roca. I am virtually passing you the pan. Note: Just in case of bad candy-making juju in your kitchen, stock LOTS of alcoholic beverages…if your candy-making goes badly, you won’t care if you’ve been sipping as you go along. Do you have these kinds of “old family recipes?” You know, from before the candy thermometer or from the 4’2″ great-grandma who used two handfuls of this and “a dollop” of that? Do you bake during the holidays or have friends and cherished family members who do? Enquiring minds love to know these things here at More Cowbell! This entry was posted in Humor, Recipes and tagged almond roca, baking, candymaking, Christmas, family, Holiday Traditions, Jenny Hansen, More Cowbell, Recipes. Bookmark the permalink. I have a fudge recipe that I used to make with my grandfather every year. We had to stir it for the exact amount of time and pour in the marshmallow cream at the perfect time and pour it into the baking sheet when it had hardened up just a bit. Then you couldn’t touch it. I thought it was a super duper top secret recipe as well. I was sure he’d created it, since that’s what he led me to believe. Years later, after he had passed, I realized his famous recipe was the exact one that is on the back of the marshmallow creme. I still make it every year. this post was hilarious and now I know I am crossing Almond Roca off my list because I freak out over silly things like how brown the egdes on cookies MUST be. Darlene, it’s always important to know your limitations. If you’re positive that you’d need to drink more heavily than the candy-making will allow, you’ve made the right choice! Now I have a craving for Rice Crispy Treats!! Oh my land – love it! Thanks for passing the candy-making pan/torch to the rest of us. It looks delicious but likely way out of my kitchen-challenged league. I personally just visit folks who bake and stock up that way. LOL! Although, as you likely read, Mom and I took up my father’s bread baking tradition this time of year. The stuff is delicious but takes like 12 hours to make because you have to RISE it three times. Insane. And, as far as secret recipes go, you are darn straight there are tricks to the trade. When Mom broke out the Betty Crocker cookbook that’s like 35 year’s old, there are pen markings and variations that you MUST incorporate to have the bread turn out “just voila!” Without that particular cookbook, it’ll never be “Dad’s bread”. Although, I told her I was going to try it in my bread maker just for shits and giggles and then I’ll do a taste test to see if it’s really alll that different! LOL! If you’re like me, making the recipes of your relative who you miss brings them closer to you while you’re in the kitchen doing it. OMG, I’ve been begging for this recipe for years, and now you post it for the entire world?!!! Wow. Making candy. You are brave. I like to keep it simple with cookies, pies, and tarts. My secret family recipe for almond roca is to go to the store and look for the pink can. I would love to be on the recieving end of roca, but I will never make it myself. Truffles are as far as I go. That pink can almond roca would build a shrine to mine…homemade is waaaaaay better. On the other hand, I’ve never made truffles…YUMMY. I remember one year when my sister and I literally set my mom’s electric hand mixer on fire trying to make divintity. It smoked and and popped before we got brave enough to yank the cord out of the socket. We cried and laughed and then went right out and bought another mixer. These days we use my large Kitchen Aid electric mixer. Kind of takes the fun out of it but at least we don’t blow the kitchen circuits. I’ve broken mixers making candy, and I have a gal pal whose battery operated boyfriend smoked the circuits like that, but I’ve NEVER heard of a mixer doing it. Your family is making history on that one! Every recipe in my tattered notebook is like this. The ones I gathered from family (also from Missouri…scary, eh?) and the ones I’ve concocted over the years. It’s in the genes. You can play with that candy thermometer all you want, but one of these days the recipe will prove it wrong. That, or relative humidity. I left the midwest while yet a child and I still give directions like, “go down the road until you see a burned out tree stump, turn left and then cross the bridge…if you see a red house, you went too far”. You know what they say about leading a horse to water. I made two kinds of fudge this past weekend, and they are cooked completely differently; there’s the melt-it-all-together-and-pour-it-in-a-pan type (my super-easy mocha fudge), and then the crazy-difficult-pass-me-the-wine white chocolate peppermint fudge (I’m making pumpkin fudge later that’s hard like this, too). When I first read the term “soft-ball stage” it was a WTF?? kind of reaction. Now I know why my mother made 15 different kinds of cookies but never a bit of fudge, LOL. And that candy thermometer – can’t they put some sort of anti-fog substance on the dang thing? How am I supposed to see what the thermometer says if I have to stick it in the steaming pot and the glass fogs up? And it’s the skinniest little line in the mercury and hard enough to read already, and then it’s stick/wipe/read (FAST! It’s fogging up again!)/repeat. Anyway, enjoy your super tradition, and good luck using all that Parkay! Soooo glad you enjoy my family – we’d love to adopt you…you’ve got sass. Dang, white chocolate peppermind fudge just SOUNDS hard. And I agree on the thermometer…I had to wipe away fog just last night! Oh boy oh boy, that looks delicious. I wish I had the volition to try it. I have a few recipes like that in my arsenal — growing up, I ADORED my grandmother’s Watergate Salad and begged her for the recipe only to discover halfway through university that it was on the lid of the occasional Cool Whip container, as was her famed Cherry Fluff. We used to make those little white powder sugar mounds, but the recipe died with me since I can’t bake to save my life. But that almond roca looks delicious. I’m afraid of how it would turn out in my kitchen! My grandmother used to make the world’s BEST pecan pies. Everybody loved them and asked her for the recipe. She would gladly give it to anyone who asked, but no one could make it taste like hers. We used to accuse her of leaving out an ingredient when she gave people the recipe. David, you laugh but I know people who do that (instead of saying “No). Lol. I SOOOO relate, and I totally get the difference between foams and foams vigorously. Same thing happens when making Fantasy Fudge, the secret family recipe of the Midwest. Granny made “dipped chocolates.” Sweet creams covered in chocolate. I still have her recipe preserved under plastic in her own handwriting. I think I’m the only family member left who makes them. You cook sugar and cream and (optional) nuts and whatever flavoring to a “soft ball” and then once it cools “until you can hold your hand on the bottom of the pot” you “beat it until it looks right.” And no, I don’t have a candy thermometer. I’m entirely to vain for that. 🙂 Besides, it wouldn’t be the same experience without the element of risk. One thing I’ve found, though, with candy. If you mess with it long enough, it turns out some kind of edible. For example, a few times when I’ve tried to fight the simple facts of life and make maple pecan dipped chocolates when it’s raining outside, I’ve messed with it long enough to end up with pecan pralines. However, I could not reproduce a pecan praline to save my life. The next time your almond roca is a mess, just keep playing with it and see what happens. Thanks for your fun post, Jenny. That is true about “messing with it” although I continually find some impossible variation for this. Example: this year is the first time I’ve baked in my new house, which used to be my mother-in-law’s. It’s one of those old tiny O’Keefe and Merrick ovens and the stovetop from the same maker and this stove gets HOT. So I make my first batch of roca yesterday, easy peezy and I’m all happy with myself. I wipe down the pan and go for round 2. 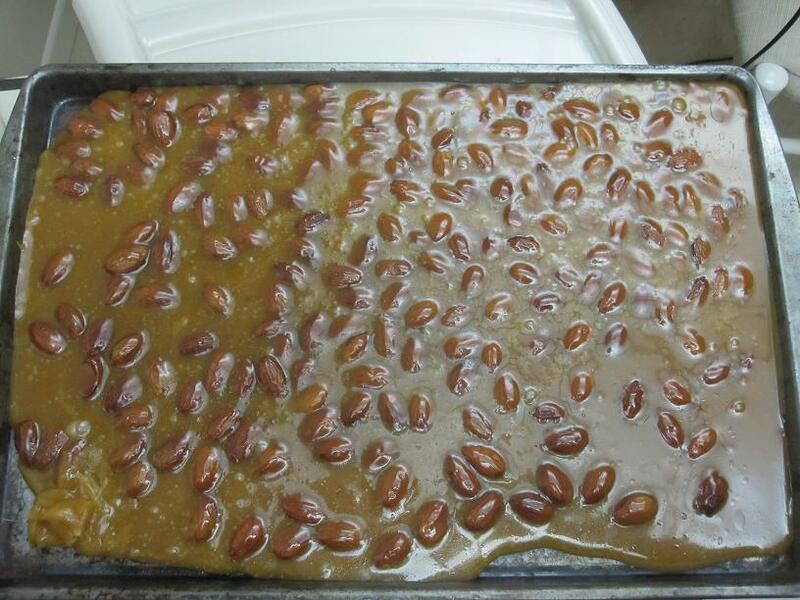 Well, when I added the almonds, the whole pan started pouring off smoke and the mixture turned brown. My mother, being raised by Depression parents, would wash and re-use the almonds when a batch didn’t take. In this case, I through them in the trash and the entire kitchen smelled like burned nuts till we took out the trash. Thanks for the recipe and the laughs … my sides are hurting. Dashing out for Parkay! 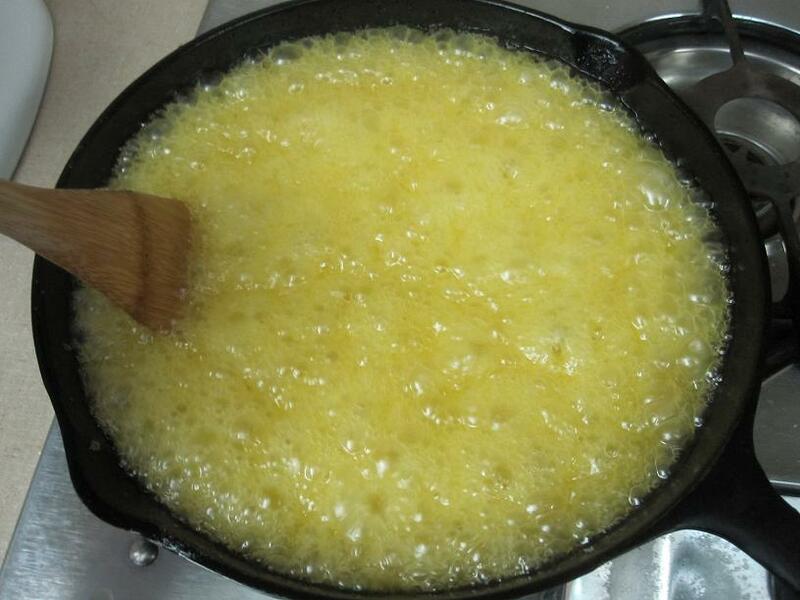 There are no tricks to the old family recipies I inherited but what you said about using a particular brand of butter or margarine is so true. I have a butterscotch/peanut butter recipe, which I inherited from my mother-in-law, and gave to my mom. My mom cannot make it, no matter how hard she tries. 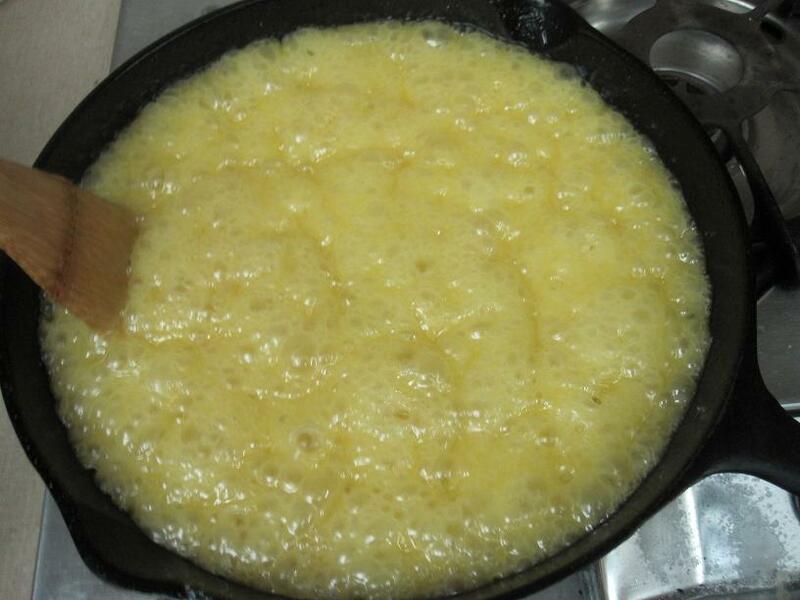 Finally, one day we were discussing it and it turned out she used real butter while I always used margarine. Now she uses margarine but because she uses a different brand, the results still aren’t the same as mine. Cool post. I got the secret family recipe for Hungarian Torte Cake. Hot damn. I tried it once and it came out right. I gave up because at the time I was spending a lot of time in commercial kitchens (I hate seperating a dozen eggs, crushing nuts etc.) so I passed on attempt 2. I’m gonna try that almond roca recipe (I don’t drink, any suggestions?). I think I’m still stunned you are a baking queen. Who knew! What a cool thing for you to make every year. My daughter and I love almond roca, but I don’t think we’ll be making this anytime soon. 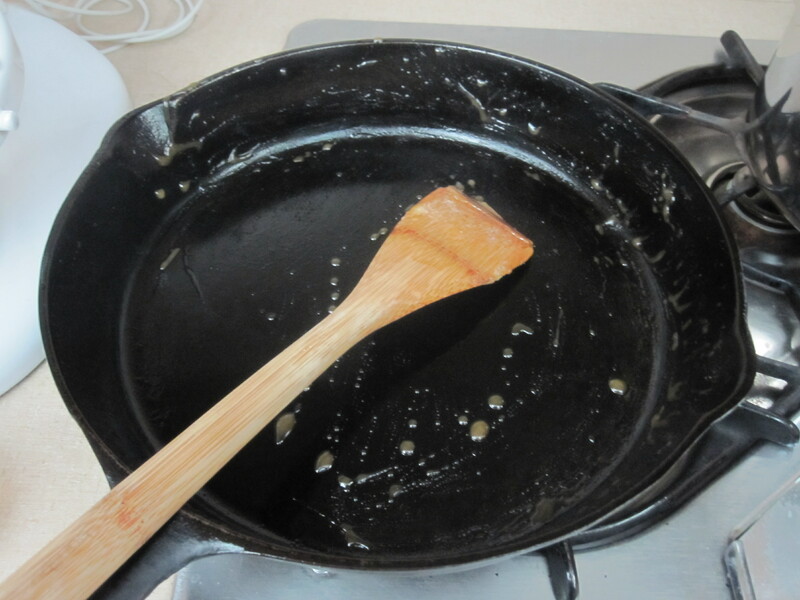 Although, I do have a cast iron skillet (three in fact) and a candy thermometer, so maybe? I used to bake all sorts of cookies and such at Christmas, but no one would eat it except me. My daughter would complain they were too fattening and my husband and son only eat ice cream and chocolate chip cookies. One year I baked up a bunch of stuff ~ Russian tea cakes, sugar cookies, thumbprints, etc… and gave them all away to friends. My family wen’t nuts that I gave away all the ‘good stuff’. Um, this was the same ‘good stuff’ I made for them and they refused to eat. I just can’t win. Like your mother and your mother’s mother that have gone before you, keep the faith! Candy making is good for you. I just know this intrinsically. Your family needs their familial soul renewed periodically. To help you with that “reawakening” process I will let you send me the stuff you bake. Think of how much stronger they will be and how much more they will appreciate you when you get home from Fedex. Happy(fill in the blank as you wish) and peace to all of good will. Extra peace to those that send chocolate. Oh, and candy-making is definitely GOOD for you…it just tries your patience. Often. Happy (fill in the blank) to you too!! Lol. I’m so going to email you if it’s not too late. Absolutely not too late – bring it, Piper! Cunning, isn’t it? Once again, the secret is in what isn’t said. Yes you need the right bowl, and yes you need the right apples, but there’s more, so much more. You need an old house (pref one mentioned in the doomsday book) with a fireplace (pref one big enough to stand in) with a roaring fire (pref while you’re not standing in the fireplace) and a small table. No I know what you’re thinking – table – bowl of apples – it’s obvious. Well, yes, you can put the bowl of apples on the table, but after all that buggering about with the complicated recipe I’d put a big bottle of brandy on it and sit down and enjoy the fire. I mean, who wants an apple when you’ve got alcohol?